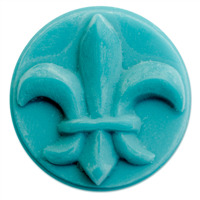 Traditionally, the fleur de lis has been used to represent French royalty, signifying perfection, light, and life. 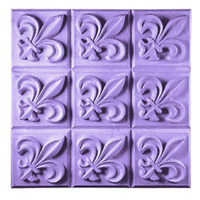 Add some class to your soap with the Square Fleur de Lis Soap Mold Tray. 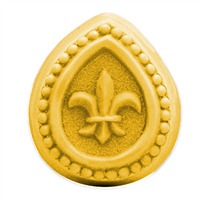 Bar Depth: 0.75" Bar Length: 1.875"
"Fleur de Lis Guest Soap Mold Tray"
COMMENTS: Beautiful details, easy to remove from tray once pressure lock seal is broken. Used WSP Three Butter MP and made these as wedding favors for my nieces wedding. They were a hit. Oh and just follow the score lines to cut, easy peasy.